1. Add the oatmeal, unsweetened almond milk, chia seeds, cinnamon, and 1 TBS maple syrup to a saucepan over medium-high heat and stir to combine. cook for 10-12 minutes, until the oats have absorbed all of the liquid. Add more almond milk as needed for thinner consistency. 2. Heat the coconut oil and remaining maple syrup in a skillet over medium heat. add a pinch of cinnamon and let the mixture heat until it’s slightly bubbling. Add the sliced banana and simmer for a few minutes on each side until lightly browned and caramelized. 3. 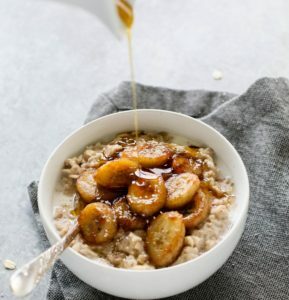 To assemble, scoop the oatmeal into a bowl and top with maple sautéed bananas, chia seeds, and maple syrup.